In this, our first year of homeschooling, I am making plans to celebrate our 100th day of school, which falls on Friday. I’m excited that we’ve been enjoying homeschooling and have made it this far! Here are some of the activities I’m planning. Do a physical activity (jumping jacks, running in place, hopping, etc.) for 100 seconds. Put together a 100-piece puzzle. Thread 100 pieces of O-shaped cereal on a piece of string and wear as a necklace (and use as an instant morning snack :). Fill three small jars with mini chocolate chips and let them choose which jar they think contains exactly 100. Research what happened on this day in history 100 years ago. Write the number 100 on a piece of paper and incorporate it into a drawing. See how many times you can bounce a ball in 100 seconds. See how quickly you can answer 100 math facts (using flashcards). 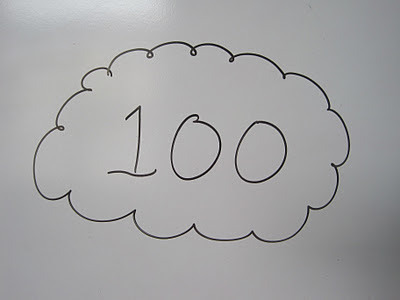 Have you ever celebrated the 100th day of school? Once I again I applaud your awesome ideas!! I think your day will be so much fun! Sadly, after 5 years of homeschooling, this is one day (the 100th day) that has overlooked celebration. Thinking it's time to change that!! Blessings upon your homeschool and congratulations on 100 days along the journey!! Congratulations on 100 days!! What fabulous ideas to celebrate. Have a great time! For a 5th grader the 100 days of school marks another special milestone. 1000 days of school k-4th at 180 days= 900. We did lots of special stuff to celebrate that when my oldest was in 5th. There's some neat ideas on the Internet for that too. Enjoy! Wow – I never realized that!! What a great milestone to mark! Thanks for sharing this with me. this will be so much fun, love all your activity ideas ! These are wonderful 🙂 I haven't been keeping track since we are still in preschool mode – but I'll keep this is mind for next year! Thanks for this! Friday my daughter's class is celebrating the 100th day of school and each student is supposed to bring in something to celebrate. I think we'll go to Dollar Tree and pick up a 100 piece puzzle. No, but what a great idea! Oh, boy, George Washington – that should be fun!! You're creative, though, so I'm sure he'll look great! Our oldest daughter did a project in school last year where she had to read a biography and, on the day the book report was due, she had to come in dressed up as that character. Since I'm not the creative type, I "advised" her that before she chose a biography, she should think through how difficult it would be to dress up as that person. She ended up choosing Annie Oakley, which wasn't too bad.